Citation: Quantum 1, 35 (2017). Correlations between spacelike separated measurements on entangled quantum systems are stronger than any classical correlations and are at the heart of numerous quantum technologies. In practice, however, spacelike separation is often not guaranteed and we typically face situations where measurements have an underlying time order. Here we aim to provide a fair comparison of classical and quantum models of temporal correlations on a single particle, as well as timelike-separated correlations on multiple particles. We use a causal modeling approach to show, in theory and experiment, that quantum correlations outperform their classical counterpart when allowed equal, but limited communication resources. This provides a clearer picture of the role of quantum correlations in timelike separated scenarios, which play an important role in foundational and practical aspects of quantum information processing. Explaining observations in terms of cause and effect is central to all of empirical science. Yet, the correlations between measurements on remote parts of entangled quantum systems can be stronger than any classical notion of cause and effect can explain. In practice, moreover, we typically face situations where communication between the measurements cannot be excluded, and with enough communication a cause-and-effect explanation would become possible. Here, we aim provide a fair comparison of classical and quantum resources and find that even with limited communication, quantum correlations still outperform their classical counterpart. These results contribute to our understanding of the non-classical nature of quantum correlations, which power a wide range of today's quantum technologies, and might thus be important for future quantum information processing applications. J. S. Bell, On the Einstein-Podolsky-Rosen paradox, Physics 1, 195 (1964). N. Brunner, D. Cavalcanti, S. Pironio, V. Scarani, and S. Wehner, Bell nonlocality, Rev. Mod. Phys. 86, 419 (2014). C. Brukner, S. Taylor, S. Cheung, and V. Vedral, Quantum Entanglement in Time, arXiv preprint quant-ph/​0402127 (2004). M. Markiewicz, P. Kurzyński, J. Thompson, S.-Y. Lee, A. Soeda, T. Paterek, and D. Kaszlikowski, Unified approach to contextuality, nonlocality, and temporal correlations, Phys. Rev. A 89, 042109 (2014). C. Budroni, T. Moroder, M. Kleinmann, and O. Gühne, Bounding Temporal Quantum Correlations, Phys. Rev. Lett. 111, 020403 (2013). T. Fritz, Quantum correlations in the temporal Clauser–Horne–Shimony–Holt (CHSH) scenario, New J. Phys. 12, 083055 (2010). A. Fedrizzi, M. P. Almeida, M. A. Broome, A. G. White, and M. Barbieri, Hardy's Paradox and Violation of a State-Independent Bell Inequality in Time, Phys. Rev. Lett. 106, 200402 (2011). M. Pawłowski, J. Kofler, T. Paterek, M. Seevinck, and Č. Brukner, Non-local setting and outcome information for violation of Bell's inequality, New J. Phys. 12, 083051 (2010). R. Chaves, J. B. Brask, and N. Brunner, Device-Independent Tests of Entropy, Phys. Rev. Lett. 115, 110501 (2015a). E. F. Galvão and L. Hardy, Substituting a Qubit for an Arbitrarily Large Number of Classical Bits, Phys. Rev. Lett. 90, 087902 (2003). A. Montina, Exponential complexity and ontological theories of quantum mechanics, Phys. Rev. A 77, 022104 (2008). M. Żukowski, Temporal inequalities for sequential multi-time actions in quantum information processing, Front. Phys. 9, 629 (2014). R. Gallego, N. Brunner, C. Hadley, and A. Acín, Device-Independent Tests of Classical and Quantum Dimensions, Phys. Rev. Lett. 105, 230501 (2010). S. Brierley, A. Kosowski, M. Markiewicz, T. Paterek, and A. Przysiȩżna, Nonclassicality of Temporal Correlations, Phys. Rev. Lett. 115, 120404 (2015). J. Bowles, N. Brunner, and M. Pawłowski, Testing dimension and nonclassicality in communication networks, Phys. Rev. A 92, 022351 (2015). D. Bacon and B. F. Toner, Bell Inequalities with Auxiliary Communication, Phys. Rev. Lett. 90, 157904 (2003). B. F. Toner and D. Bacon, Communication cost of simulating Bell correlations. Phys. Rev. Lett. 91, 187904 (2003). S. Pironio, Violations of Bell inequalities as lower bounds on the communication cost of nonlocal correlations, Phys. Rev. A 68, 062102 (2003). T. Vértesi and E. Bene, Lower bound on the communication cost of simulating bipartite quantum correlations, Phys. Rev. A 80, 062316 (2009). M. J. W. Hall, Relaxed Bell inequalities and Kochen-Specker theorems, Phys. Rev. A 84, 022102 (2011). K. Maxwell and E. Chitambar, Bell inequalities with communication assistance, Phys. Rev. A 89, 042108 (2014). R. Chaves, R. Kueng, J. B. Brask, and D. Gross, Unifying Framework for Relaxations of the Causal Assumptions in Bell's Theorem, Phys. Rev. Lett. 114, 140403 (2015b). J. B. Brask and R. Chaves, Bell scenarios with communication, J. Phys. A 50, 094001 (2017). M. Ringbauer, C. Giarmatzi, R. Chaves, F. Costa, A. G. White, and A. Fedrizzi, Experimental test of nonlocal causality, Sci. Adv. 2, e1600162 (2016). R. Chaves, D. Cavalcanti, and L. Aolita, Causal hierarchy of multipartite Bell nonlocality, Quantum 1, 23 (2017). C. J. Wood and R. W. Spekkens, The lesson of causal discovery algorithms for quantum correlations: Causal explanations of Bell-inequality violations require fine-tuning, New J. Phys. 17, 033002 (2015). A. J. Leggett and A. Garg, Quantum mechanics versus macroscopic realism: Is the flux there when nobody looks? Phys. Rev. Lett. 54, 857 (1985). J. Pearl, Causality (Cambridge University Press, 2009). J. S. Bell, The theory of local beables, Epistem. Lett. 9, 11 (1976). C. H. Bennett, G. Brassard, C. Crépeau, R. Jozsa, A. Peres, and W. K. Wootters, Teleporting an unknown quantum state via dual classical and Einstein-Podolsky-Rosen channels, Phys. Rev. Lett. 70, 1895 (1993). C. H. Bennett and S. J. Wiesner, Communication via one- and two-particle operators on Einstein-Podolsky-Rosen states, Phys. Rev. Lett. 69, 2881 (1992). H. J. Briegel, D. E. Browne, W. Dür, R. Raussendorf, and M. Van den Nest, Measurement-based quantum computation, Nat. Phys. , 19 (2009). S. Popescu, Bell's Inequalities and Density Matrices: Revealing “Hidden” Nonlocality, Phys. Rev. Lett. 74, 2619 (1995). R. Gallego, L. E. Würflinger, R. Chaves, A. Acín, and M. Navascués, Nonlocality in sequential correlation scenarios, New J. Phys. 16, 033037 (2014). N. Langford, T. Weinhold, R. Prevedel, K. Resch, A. Gilchrist, J. O'Brien, G. Pryde, and A. White, Demonstration of a Simple Entangling Optical Gate and Its Use in Bell-State Analysis, Phys. Rev. Lett. 95, 210504 (2005). S. Hill and W. K. Wootters, Entanglement of a Pair of Quantum Bits, Phys. Rev. Lett. 78, 5022 (1997). N. Harrigan and R. W. Spekkens, Einstein, Incompleteness, and the Epistemic View of Quantum States, Found. Phys. 40, 125 (2010). M. J. W. Hall, Local Deterministic Model of Singlet State Correlations Based on Relaxing Measurement Independence, Phys. Rev. Lett. 105, 250404 (2010). R. Chaves, Polynomial Bell Inequalities, Phys. Rev. Lett. 116, 010402 (2016). C. M. Lee and R. W. Spekkens, Causal Inference via Algebraic Geometry: Feasibility Tests for Functional Causal Structures with Two Binary Observed Variables, J. Causal Inference 5, 6 (2017). C. Emary, N. Lambert, and F. Nori, Leggett–Garg inequalities, Rep. Prog. Phys. 77, 016001 (2014). L. Clemente and J. Kofler, Necessary and sufficient conditions for macroscopic realism from quantum mechanics, Phys. Rev. A 91, 062103 (2015). M. Ringbauer, C. J. Wood, K. Modi, A. Gilchrist, A. G. White, and A. Fedrizzi, Characterizing Quantum Dynamics with Initial System-Environment Correlations, Phys. Rev. Lett. 114, 090402 (2015). H. Buhrman, R. Cleve, S. Massar, and R. De Wolf, Nonlocality and communication complexity, Rev. Mod. Phys. 82, 665 (2010). M. Pawłowski, T. Paterek, D. Kaszlikowski, V. Scarani, A. Winter, and M. Zukowski, Information causality as a physical principle. Nature 461, 1101 (2009). T. Christof and A. Löbel, PORTA - POlyhedron Representation Transformation Algorithm, (2009). J. Clauser, M. Horne, A. Shimony, and R. Holt, Proposed Experiment to Test Local Hidden-Variable Theories, Phys. Rev. Lett. 23, 880 (1969). R. Horodecki, P. Horodecki, and M. Horodecki, Violating Bell inequality by mixed spin-12 states: necessary and sufficient condition, Phys. Lett. A 200, 340 (1995). Zhen-Peng Xu and Adán Cabello, "Quantum correlations with a gap between the sequential and spatial cases", Physical Review A 96 1, 012122 (2017). Rafael Chaves, Gonzalo Carvacho, Iris Agresti, Valerio Di Giulio, Leandro Aolita, Sandro Giacomini, and Fabio Sciarrino, "Quantum violation of an instrumental test", Nature Physics 14 3, 291 (2018). G. Carvacho, R. Chaves, and F. Sciarrino, "Perspective on experimental quantum causality", EPL (Europhysics Letters) 125 3, 30001 (2019). Martin Ringbauer, Fabio Costa, Michael E. Goggin, Andrew G. White, and Alessandro Fedrizzi, "Multi-time quantum correlations with no spatial analog", npj Quantum Information 4 1, 37 (2018). R. V. Nery, M. M. Taddei, R. Chaves, and L. Aolita, "Quantum Steering Beyond Instrumental Causal Networks", Physical Review Letters 120 14, 140408 (2018). 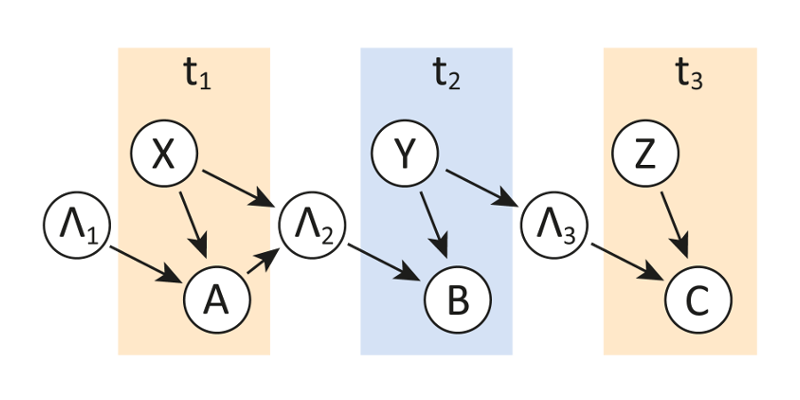 Philip Taranto, Simon Milz, Felix A. Pollock, and Kavan Modi, "Structure of quantum stochastic processes with finite Markov order", Physical Review A 99 4, 042108 (2019). Philip Taranto, Felix A. Pollock, Simon Milz, Marco Tomamichel, and Kavan Modi, "Quantum Markov Order", Physical Review Letters 122 14, 140401 (2019). Fabio Costa, Martin Ringbauer, Michael E. Goggin, Andrew G. White, and Alessandro Fedrizzi, "Unifying framework for spatial and temporal quantum correlations", Physical Review A 98 1, 012328 (2018). Cristhiano Duarte, Samuraí Brito, Barbara Amaral, and Rafael Chaves, "Concentration phenomena in the geometry of Bell correlations", Physical Review A 98 6, 062114 (2018). The above citations are from Crossref's cited-by service (last updated 2019-04-25 11:03:52) and SAO/NASA ADS (last updated 2019-04-25 11:03:53). The list may be incomplete as not all publishers provide suitable and complete citation data.